First off I want to thank everyone in this forum. I am new at baking sourdough bread. I find it much more difficult than baking a conventional loaf but in a weird way when I stumble I read more posts and take away something each day. You have all been great answering my basic questions and sharing your tips and knowledge. I am soaking in as much as I can. So today I bakes a loaf of sourdough bread. I see a few issues but all in all I am very happy so far. Being a beginner I thought it was best to stick with a recipe and add ingredients to the gram and that's what I did on my last loaf. 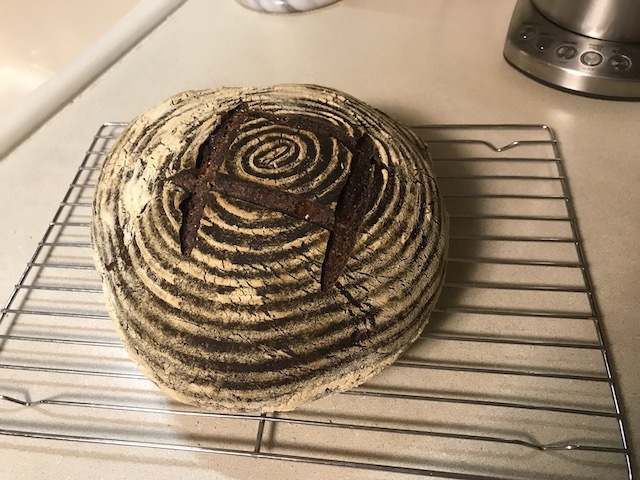 It ended up being a disaster loaf and it actually looked like a 4 inch high by 12 inch round steamed dumpling because I baked it in a dutch oven with the lid on for 20 minutes per the recipe. Well someone last week told me to watch the loaf and I did just that. I used the recipe as a guide only. I made the dough to the consistency I felt was correct. Stretching and folding the dough per the recipe but stoping when I thought it was time to. I wanted to post my results. Nice looking loaf - and yes - sourdough requires lots of practice. I bake most of my breads in a DO with the lid on for 20 minutes minimum as a standard practice to trap the steam coning out of the bread to get max spring and bloom. To get a steamed bun you would have to take the dough out then and not finish the bread off with at least another 15 minutes of baking at 425 F with the lid off until the middle tested 208 F with an instant read thermometer? When you mention bloom and over proofed, exactly what do you mean and how can you tell? I get confused on this term. "I was heading for a top burn at internal 204°." If your loaf is beginning to burn before being fully baked, take a piece of aluminum foil and place it over the loaf. That will prevent burning the crust but still allow the loaf to bake some more. Yep - this was one of the key insights that improved my loaves, both SD and otherwise...letting the dough tell me when it's ready, and not my expectation for how long bulk or proofing will take. Related to that, I've learned to pay more attention to the the "proofiness" of the dough -- how full of gas it is -- than how much the volume increases (e.g. "doubling in size or whatnot).